Totally refreshed with new models, new sizes, new shapes and new mast connection system! Twin Tracks have been installed in order to match all demands, whatever the discipline, level or mounting style. 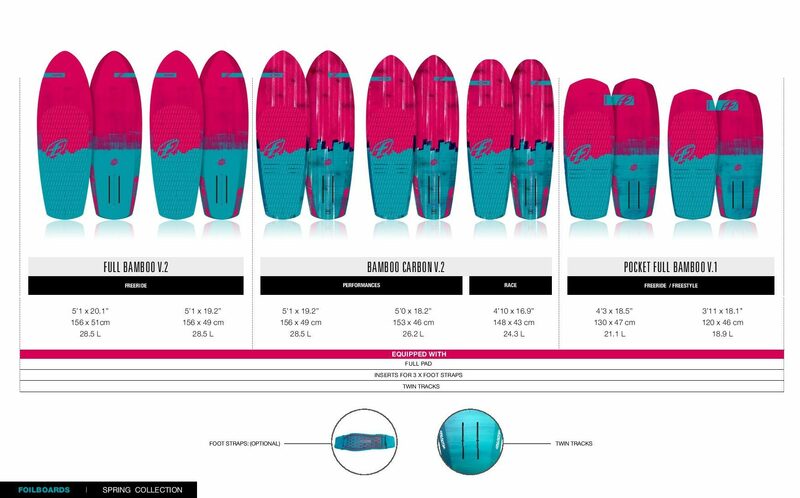 NEW US Twin tracks will be equipped on all F-One foilboards except for the 2018 Mitu Convertible which has a KF BOX and was released last September. This system is offering full compatibility with all hydrofoils using a plate or insert mounting system from other brands, all existing F-One hydrofoils from current range (by adding a KF or DKF top plate) and also, all of our future hydrofoils v2. Tracks will also allow you to finely tune your balance by sliding the foil forward or backward within the system. NEW Shapes on all dedicated foilboards! Moderate front-end rocker with more volume offering stability, comfort and support during water touch downs. Beveled & thinner rails which help while edging, chop is no longer disturbing. Better control & less drag. Double concave for smoother landing when touching down. Shape designed for advanced foiling performance! The bamboo construction foilboards were crafted to reduce the momentum and drag of the board to bring your maneuvers and carving to the next level. “Minimum size for maximum fun!”, this is the mantra behind these pocket boards. By reducing the length it is possible to enlarge significantly the possibilities for all kinds of maneuvers and further engage into carving. The Pocket Series share similar DNA on the bottom with a double concave and some distinctive bevels. Their outline is adapted specifically to this very compact share, with the maximum width carried almost all the way forward. This keeps the boards very easy to use and accessible to all intermediate and advanced riders. Built with a bamboo sandwich laminate over a lightweight EPS core, these boards are fitted with a large deck pad for total comfort. 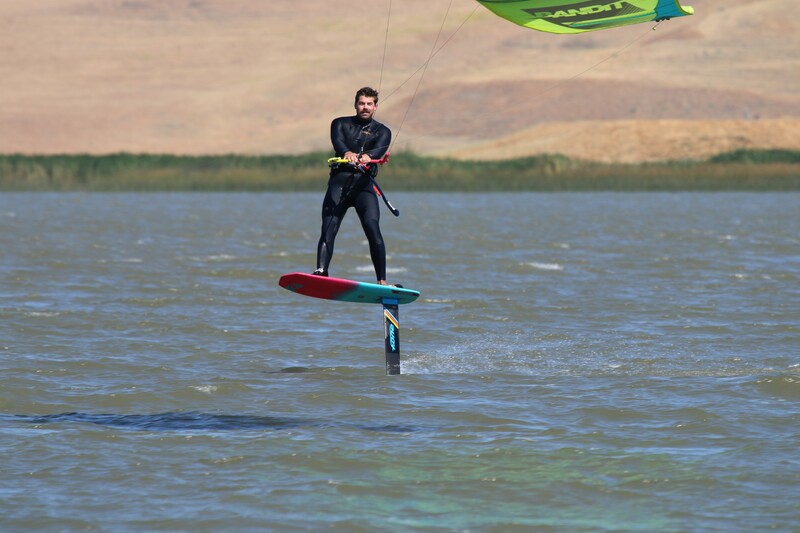 Compact, playful, the Pocket foilboard provides ultimate flying sensations, tight turns and optimal foiling experience. This will be the best choice for intermediate to advanced free-ride foilers. Two sizes available, 49 & 51 which is referring to the overall width of the board in centimeters. Our most popular model is the 51 width which is forgiving for beginners and offers a lot of room for foot placement. Their dimensions and volume make these boards very stable and easy to use. The rocker line is designed for a quick and easy lift-off with good release. The bottom is shaped with a double concave at the front for smoother touch-downs. The wide point is carried quite some way forward to provide more stability. The rails are thinned out using bevels on the bottom for more tolerance and less resistance when the board hits the water when edging. Built with a bamboo sandwich laminate over a lightweight EPS foam core, these boards come with a large deck pad for total comfort. They too are also equipped with the twin track system on the bottom to match any foil equipped with a 4-bolt top plate. Three sizes to choose from in our carbon construction, the Carbon 43 Race Pro, Carbon Performance 46 & 49. Available in three different widths, these boards were created to be 100% dedicated to performance and full-on racing. Besides the reduced outline, the bevels are steeper on the smaller boards to further reduce the impact of the rails hitting the water. This shape reaches it’s epitome on the 148 x 43 which is the full-on race board; thin outline with parallel rails carried a long way forward, minimum rail profile, etc. These boards benefit from a bamboo carbon construction with brushed finish to achieve a lighter weight. this lighter weight brings performances obviously but also a fantastic feeling once in the air. 51TS v1 + MITU Convertible are completing the range. 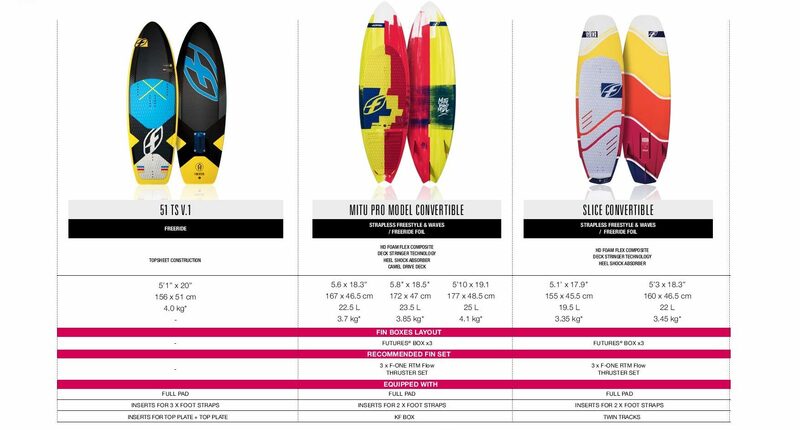 Mitu Foil Convertible offered in 5’6, 5’8 & 5’10 sizes.